Cherie Toney and Erneita Daley, and Habitat NYC CEO Karen Haycox. Brooklyn, NY Habitat for Humanity New York City celebrated the completion of Dean Street Residences with a ribbon cutting ceremony on Saturday, September 22nd, welcoming 15 families to their new, affordable homes in the Brownsville neighborhood. 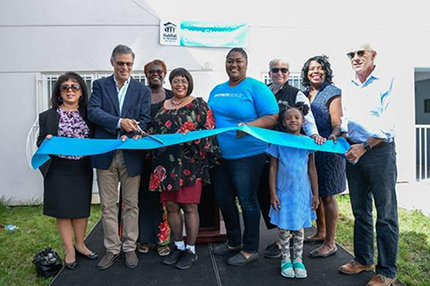 The celebration brought together Habitat Homeowners, government officials, volunteers, donors and staff who worked together to bring this project to life and create 15 new units of affordable homeownership. Dean Street Residences broke ground in 2016 at the corner of Dean St. and Mother Gaston Blvd., engaging construction professionals and volunteers in the development of a four-story, multi-family building comprised of 15 two-bedroom apartments to be sold at an affordable rate to hard-working, lower-income families. Amenities include a landscaped backyard and on-site laundry facilities. The building also meets Enterprise Green Communities standards that ensure healthy environments and cost-saving fuel efficiency. The project architect was OCV Architects. While under construction, Dean Street hosted many special volunteer build events including Martin Luther King Jr. Day of Service, Fleet Week, Women Build and Build for Unity. In total, 2,167 volunteers devoted 19,518 hours to the construction, finishing, and beautification of Dean St.
Dean St. was made possible through support from many partner agencies including New York City Department of Housing Preservation and Development, New York State Homes and Community Renewal, New York State Affordable Housing Corporation, New York State Housing Trust Fund, Office of the Brooklyn Borough President and the City and State administrations. Several board members, volunteers, Homeowners and elected officials came out to support the completion of Dean Street Residences and celebrate the exciting milestone for Habitat NYC and families moving into affordable homes, including New York State Senator Roxanne J. Persaud and New York State Assemblywoman Latrice Walker. “This is a huge accomplishment and helps to fill an urgent need we see in Brooklyn. I would like to thank Habitat NYC and partners for their hard work making affordable housing a reality for the new residents at Dean Street. It is only as a community will we end the homelessness that impacts our neighbors and friends across New York City,” Senator Roxanne J. Persaud said. “Home ownership is one of the most reliable pathways to the middle class. But with property values steadily rising across the city, it has remained out of reach for many low-income New Yorkers. The opening of the new Dean Street Residences today signal our commitment to ensuring that everyone has a shot at home ownership and the American Dream. I am incredibly proud to have partnered with Habitat NYC and Borough President Adams’ office on this effort,” said council member Rafael Espinal. Habitat NYC serves hard-working New York families – often including single parents, seniors and public service employees – based on their need, ability to pay and willingness to partner. Habitat Homebuyers are of low- to moderate- income, have stable employment history and decent credit scores, and agree to fulfill the “sweat equity” component and participate in financial and homeownership education. 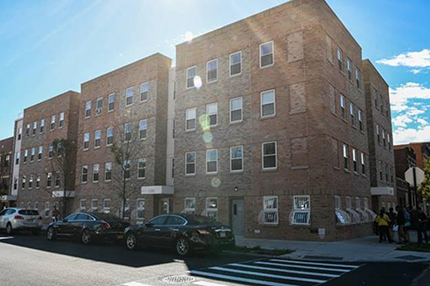 Since the New York City affiliate was founded in 1984, Habitat for Humanity New York City has served more than 700 families throughout the five boroughs.